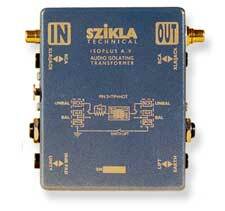 The Isoplus AV is a Broadcast Quality Line Isolator / Hum Eliminator. It can be used to balance an unbalanced line such as the output of a CD player, to preserve fidelity over a long cable run, or to unbalance a balanced line in order to access an unbalanced input on a mixing desk or other device. Devices with dissimilar input / output connectors can be accommodated via the unusual configuration of XLR, TRS Jack and RCA in and out. The 20dB pad is useful when connecting high level devices such as computer headphone or video recorder outputs to low level input devices.